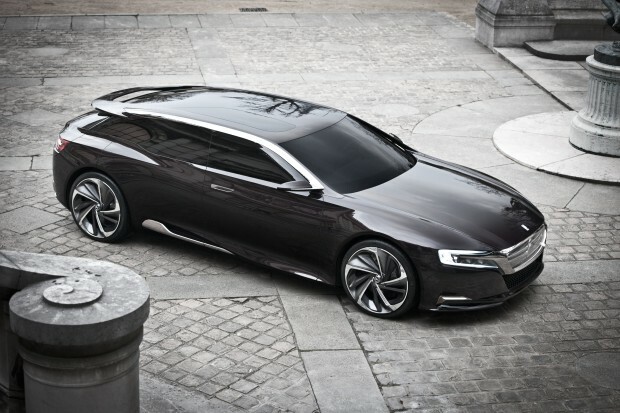 Citroën will present its concept car Numero 9 at next car show in Beijing, which is the forerunner of the coming DS9. The estate model will replace the Metropolis sedan model showcased last year, but the design is still breath-taking. A little shorter that the Metrolpolis (4m 93 versus 5m 30), and lower (1m 27), it is still wide (1m 94) and weighs 1.5 tons. The Numero 9 introduces new style elements for the next three models in the DS range, which will be, according to Citroën, a C class sedan (DS6? ), a SUV (DS7?) and a D class sedan (DS9?). It will be driven by a 1.6L, 225 horsepower petrol motor (developed by BMW) and with a 70 horsepower electric motor, which will use the same system as the Hybrid 4. On the other hand, the lithium-ion battery can be recharged in 3.5 hours, which provides and autonomy of 50 km. According to Citroën, the consumption level is at 1.7L per 100km, and CO2 emissions at 39g/km. The full 295 horsepower permits a top speed of 244km/h and an acceleration of 0 to 100km in 5.4 seconds. This vehicle offers a solution to readers of this blog who were sorry that PSA’s Hybrid4 system was exclusively diesel and didn’t include a rechargeable battery. PSA seems to be on the right track. We can now wish for rapid commercialization, and that this configuration is also applied to other models in the PSA range. Beyond environmental considerations: This car is my favorite concept-car of the year! I’d like to see the french president in a car like this.